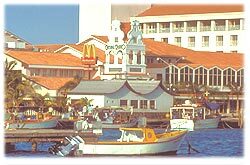 Most of the best shopping is to be found in the downtown area of Oranjestad, the capital, but many of the shops have satellite branches in a few of the larger hotels. Quality merchandise from all over the world, particularly Latin America and Europe, attract many shoppers looking for bargains. Store hours are typically 8 am to 6 pm with a two-hour break for lunch between noon and 2 pm. A dip in the cool, tranquil waters of Baby Beach for swimming and snorkeling provides the perfect respite between visits to a variety of different historical and natural attractions including Arashi Beach, the Natural Bridge and the island's caves. Experience a romantic intimate dinner while cruising along the scenic coastline of Aruba. Get the most out of a half-day of fun and adventure by exploring the island by 4WD. Visit such wondrous sights as the Casibari Rock Formations, Bushiribana Gold Mill Ruins, Natural Bridge and Black Stone beach. Ride your own All Terrain Vehicle through the rugged countryside of Aruba and visit Arikok National Park. Lunch is at a tropical island hideaway. (Tours starting from USD $38 per person). Geographia has partnered with Viator to provide exciting adventure experiences in Aruba. In keeping with Aruba's multicultural heritage, restaurants cater to a wide variety of tastes and feature such specialties as French, Indonesian, Argentinian, Japanese, Dutch, Italian, and Latin American cuisines. Authentic Aruban cuisine is also offered at many establishments. Be sure to try the Scavechi (marinated fried fish) served with Funchi, an Aruban version of polenta. A gratuity of between 10% and 15% for service is usually added to the bill automatically. To round out the evening, the island's nightclubs offer dancing to many different kinds of music including: jazz, pop, tumba, salsa, reggae, calypso and soca. Between the hotels and the racquet clubs, there are top quality tennis courts throughout the island. The Aruba Raquet Club is ATP sanctioned deigned by Stan Smith Design International and features eight courts, and a healthclub. There are two golf courses on the island, the professional calibre 18-hole Tierra del Sol designed by Robert Trent Jones II and the 9-hole Aruba Golf Course. For children, there is the Joe Mendez Mini-Golf, which includes bumper boat and paddle boat rides and a variety of other games. There are several stables on the island that rent horses for romantic rides along the beach, or to explore the rugged outback. Surprisingly, bowling is a very popular sport in Aruba, and local teams go on to compete in world championships. A state-of-the-art bowling center is located on the Eagle Strip. The Drive-In movie theater is still very popular with local people. Most of the films are American, with occasional releases from Europe and Latin America. A new multiplex cinema has just been completed at Seaport Village. Nightlife generally centers around the island's eleven casinos, where in addition to gambling at craps, roulette, blackjack, baccarat, and slot machines, floorshows and live entertainment are regular features.